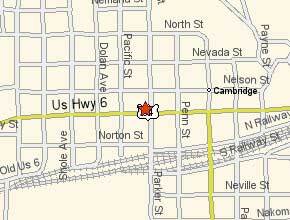 Located in the friendly town of Cambridge, Nebraska (pop. 1041), just an hour south of Interstate-80 and halfway between Omaha, NE and Denver, CO on historic US Route 6 & 34. We like to call Cambridge The Village on the Green to paint a picture of a small town bordered on the north and east with a lovely golf course and picturesque park, a tree-lined river on the south, and completely surrounded by natures scenic beauty and charming farms. The beautiful Medicine Creek State Recreation Area, just 10 minutes north of town, accesses 6,000 land acres of nature conserved and Harry Strunk Lake, a definite best-kept secret for enjoyment of all water sports with 2,000 acres of water and 29 miles of shoreline. Benke Aviation is located 1 mile northeast of Cambridge. The lighted, concrete 4,100 runway is designed to handle up to small jet aircraft. Facilities include a pilots lounge, hanger accommodations, 100 low lead aviation fuel and NDB radio station. A 4-passenger Cherokee 180 is available for rent.